This is the home page of our website which celebrates the British Arts and Crafts movement. The site is an educational and information resource, helping to broaden interest in the Arts and Crafts Movement. 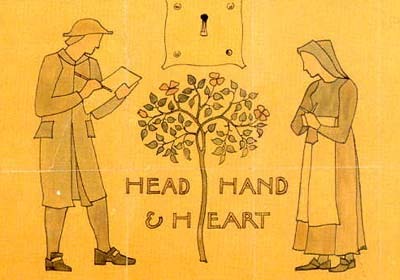 The motto 'Head Hand and Heart' is taken from an inscription used by Charles Voysey, which became the motto for the Society of Designers in 1896. These three words are the keys to understanding Arts and Crafts: 'Head' for creativity and imagination, 'Hand' for skill and craft, 'Heart' for honesty and for love. We hope you enjoy this site and welcome comments or suggestions, so please do contact us.